A team of Australian engineers has proven—with the highest score ever obtained—that a quantum version of computer code can be written, and manipulated, using two quantum bits in a silicon microchip. The advance removes lingering doubts that such operations can be made reliably enough to allow powerful quantum computers to become a reality. The result, obtained by a team at Australia's University of New South Wales (UNSW) in Sydney, appears today in the international journal, Nature Nanotechnology. The quantum code written at UNSW is built upon a class of phenomena called quantum entanglement, which allows for seemingly counterintuitive phenomena such as the measurement of one particle instantly affecting another - even if they are at opposite ends of the universe. "This effect is famous for puzzling some of the deepest thinkers in the field, including Albert Einstein, who called it 'spooky action at a distance'," said Professor Andrea Morello, of the School of Electrical Engineering & Telecommunications at UNSW and Program Manager in the Centre for Quantum Computation & Communication Technology, who led the research. "Einstein was sceptical about entanglement, because it appears to contradict the principles of 'locality', which means that objects cannot be instantly influenced from a distance." Physicists have since struggled to establish a clear boundary between our everyday world—which is governed by classical physics—and this strangeness of the quantum world. For the past 50 years, the best guide to that boundary has been a theorem called Bell's Inequality, which states that no local description of the world can reproduce all of the predictions of quantum mechanics. 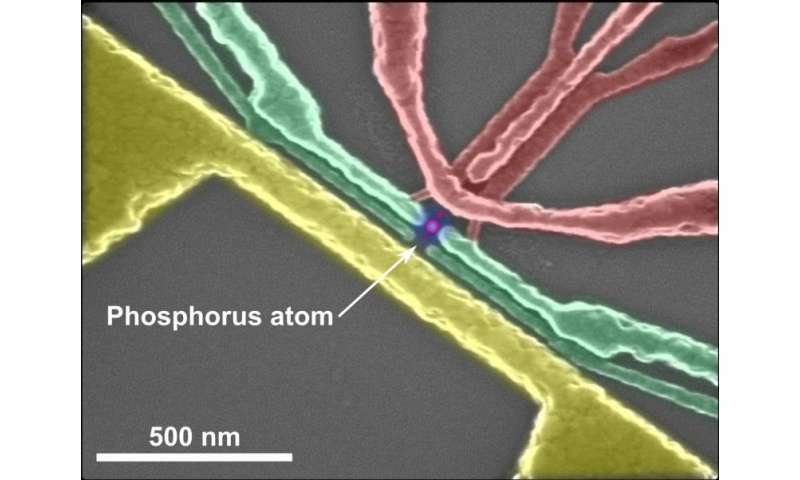 In the UNSW experiment, the two quantum particles involved are an electron and the nucleus of a single phosphorus atom, placed inside a silicon microchip. These particles are, literally, on top of each other—the electron orbits around the nucleus. Therefore, there is no complication arising from the spookiness of action at a distance. However, the significance of the UNSW experiment is that creating these two-particle entangled states is tantamount to writing a type of computer code that does not exist in everyday computers. It therefore demonstrates the ability to write a purely quantum version of computer code, using two quantum bits in a silicon microchip—a key plank in the quest super-powerful quantum computers of the future. WOW! This is super cool, this brings me great hope that we'll see quantum computers entering the consumer market in the next decade or two. This is excellent news. But, article quality in no so much. Fourth to last paragraph; says superposition is created from entanglement, which is not at all true. Can have superposition & zero entanglement. I have been dying for this stage to be reached! I'm the type to kind of swoon over the idea of an if statement checking to see if two variables are entangled. I would love to see particles in object oriented programming with spin, charge, and other qualities accessible as components.